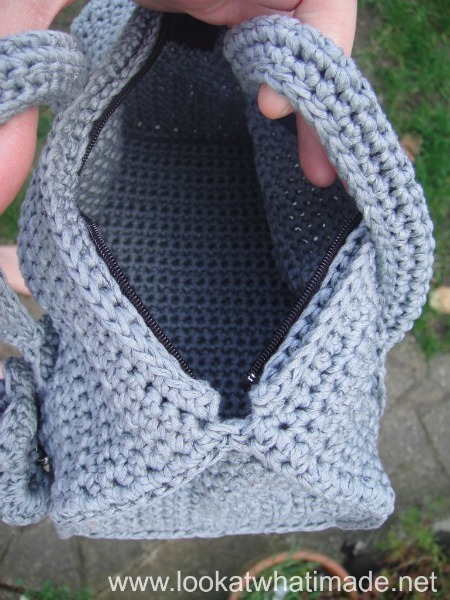 This Crochet Duffel Purse is by far my favourite self-made pattern yet. I have tried my best to explain it in such a way that the pattern is easy to follow. It is, after all, a very easy pattern. I just got bogged down a bit by the explanation for doing the seams. The flower is not included in the pattern, as it is not my own creation, but you can follow this crochet flower link to find the instructions on craftstylish. For this occasion I have made the flower detachable by sewing it onto a brooch back. The grey button is another one of my many upcycled buttons. I used Ice Mercerized Lase Cotton in grey. About 300 grams. Please note: all instructions between asterisks should be repeated (in the order they are written in) the amount of times specified. *Sc inc, sc* x 2, for example, will mean: sc inc, sc, sc inc, sc. 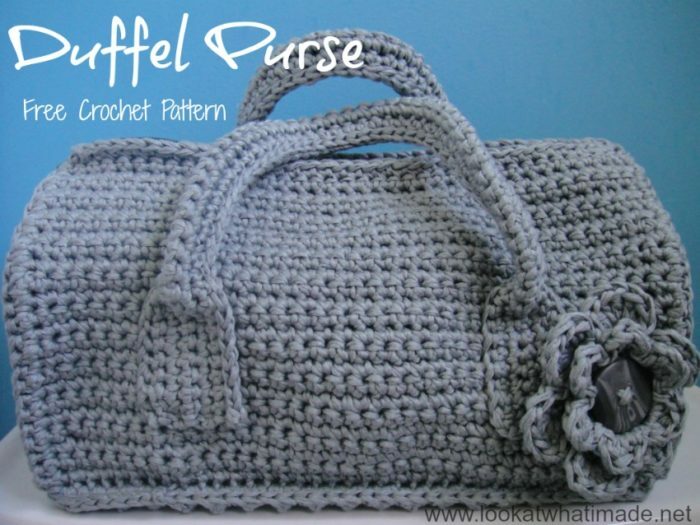 You can find the pattern for the Crochet Duffel Purse here. would there be another good example out there you would recommend to replace it? The link works for me, so I am not sure what is going wrong for you. I would suggest that the flower from Sophie’s Universe would work perfectly, though, if you cannot access the pattern link. I just found this awesome pattern. I was wondering if I could get a good result if I did use acrilic if I lined it with material or if I should just use a cotton? I have a yarn that I want to use. I know accrilic stretches a lot. It will be fine if you line it :) I prefer cotton because of the non-stretch, but that’s just personal preference. Hi Tammy. This was one of my first patterns and I am sad to say that it is not my best pattern-writing work. I went up into the loft to find it so that I could measure it for you, but I couldn’t find it! It is a small bag. Approx. 15 cm x 25 cm in size. As soon as I find it, I will update the pattern for you. 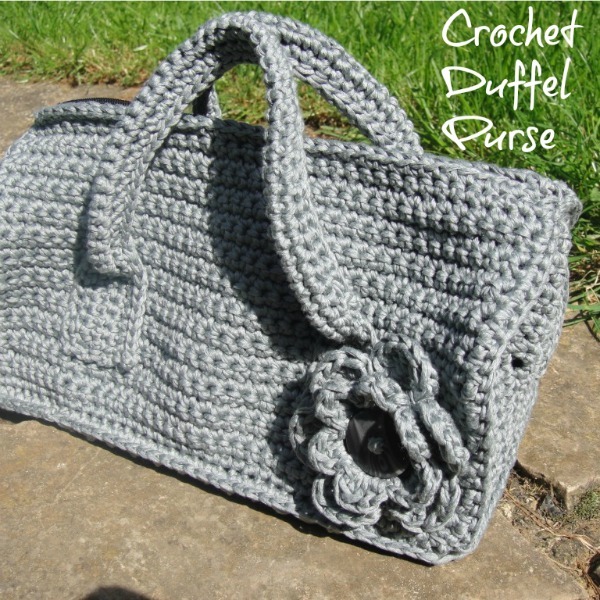 If you need a bigger bag, feel free to use chunky yarn and a 6mm hook (which is what I did for a friend of mine). Sorry I can’t be of more assistance at the minute. I was wondering if I could permission to make this for sale? The (religious) Sisters at our church sometimes sell little things or the church has a coffee morning with a stall to raise money for charities. I’d love to be able to make an donate this bag, it’s so cute! Of course I won’t, if you don’t want people to sell the bag, so I thought I should ask. Either way, it’s a lovely bag. I’m working on the bag sides 1) 38 ch 2) sc in every other st across how many st should I have for row 3-25. Linda, I should have chosen my words more carefully. I mean sc in each remaining chain. You should have 37 sc for each row. This looks like a fabulous bag. I haven’t tried it yet, but is there anyway to make it larger so that it can hold more STUFF :) I love your patterns. Thanks so much for sharing your talents. Hi Bev. I have made a bigger version for a work colleague of mine, but the bigger it gets, the more ungainly it becomes, so unfortunately this is it for now. You can always make it with thicker yarn and a bigger hook, but I wouldn’t go more than twice the size. I am so confused on row 4 of the side panels of this bag. I have done this stitch for stich 5 times and still don’t have enough stitches left to complete the row.. Can you please help me? Hi Malynda. Can you clarify if you are talking about the rounded ends or the sides with the handles on them? I suspect you’re talking about the ends, but just want to check so that I can help you better. I’m making this gorgeous duffel and love how it looks so far, but the base seems very short compared to the length of the sides. I have 37 rows altogether, but when I line it up with the sides ther is about an inch difference. Should I add a few extra rows on base? Carolyn, I have never needed to add rows, but you are welcome to if you feel you need to. You will just need to adjust your attachment accordingly. Hi,I’d like to start off by saying I love this pattern. I started working the pattern but am concerned about how my pieces are turning out. I’m following the pattern to the stitch but my pieces are turning out over small. Can you offer any advise? I hope my email answered your question, Tracy! Hi, all instructions between asterisks need to be repeated (in the order they are written in) the amount of times stipulated. So *sc inc, sc* x 2 will be: sc inc, sc, sc inc, sc. Dis pragtig Deeds. Het jy gesien jy het 202 views!!! En wie is die mense wat comment? Ken jy hulle of is jou site nou uiteindelik genotice deur buitestaanders? Dis awesome!!! Lol jaans. As ek maar 200 belangstellers geken het. Hulle is “buitestaanders”. Ek sit my patrone op ravelry en dan mission hulle oor hientoe om die patroon te kom kry. Very nice! Cute bag for all seasons! OooOoh, now that is cute!!! !